Plain concrete, commonly known as concrete, is an intimate mixture of binding material, fine aggregate, coarse aggregate and water. This can be easily moulded to desired shape and size before it looses plasticity and hardens. Plain concrete is strong in compression but very weak in tension. The tensile property is introduced in concrete by inducting different materials and this attempt has given rise to RCC, RBC, PSC, FRC, cellular concrete and Ferro cement. In this chapter proportioning, mixing, curing, properties, tests and uses of plain concrete is dealt in detail. 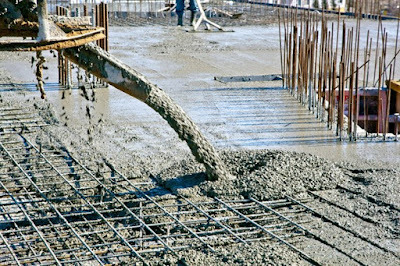 The other improved versions of concrete are explained and their special properties and uses are Discussed in this post. A small quantity of admixtures like air entraining agents, water proofing agents, workability agents etc. may also be added to impart special properties to the plain concrete mixture. is the ratio of weights of cement to sand to coarse aggregate. and the voids in sand are filled with cement paste. Proportion of ingredients usually adopted for various works are shown in below figure. surrounding surfaces like stone and bricks. Generally richer mix (with more cement) gives more strength. Setting time starts after 30 minutes and ends after 6 hours. Hence concrete should be laid in its mould before 30 minutes of mixing of water and should not be subjected to any external forces till final setting takes place. prevent shrinkage of cement. Fine aggregate consists of river sand. It prevents shrinkage of cement. ingradients takes place. It adds density to concrete, since it fills the voids. Denser the concrete higher is its strength. which means water makes it possible to mix the concrete with ease and place it in final position. More the water better is the workability. However excess water reduces the strength of concrete. 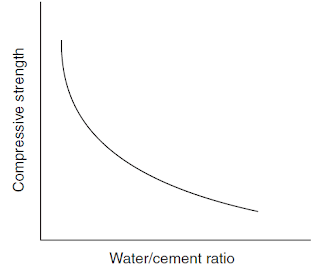 below graph shows the variation of strength of concrete with water cement ratio. To achieve required workability and at the same time good strength a water cement ratio of 0.4 to 0.45 is used, in case of machine mixing and water cement ratio of 0.5 to 0.6 is used for hand mixing. box is made with wooden plates, its volume being equal to that of one bag of cement. One bag of cement has volume of 35 litres. The required amount of sand and coarse aggregate is added by measuring on to the gauge box. 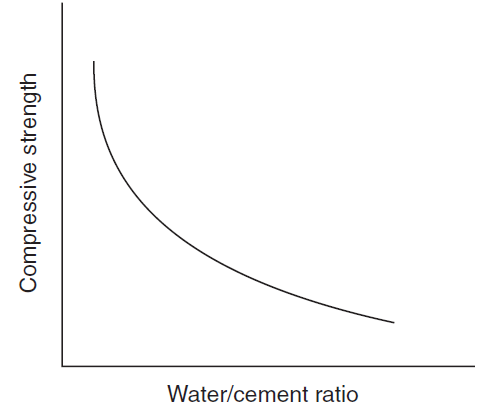 The quantity of water required for making concrete is found after deciding water cement ratio. For example, if water cement ratio is 0.5, for one bag of cement (50 kg), water required is 0.5 × 50 = 25 kg, which is equal to 25 litres. Suitable measure is used to select required quantity of water. Volume batching is not ideal method of batching. Wet sand has higher volume for the same weight of dry sand. It is called bulking of sand. Hence it upsets the calculated volume required. 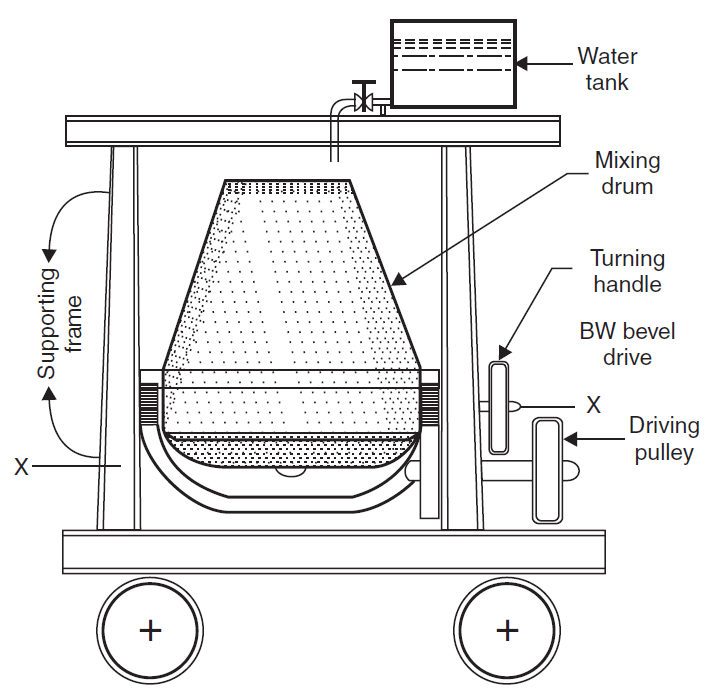 (b) Weight Batching: This is the recommended method of batching. A weighing platform is used in the field to pick up correct proportion of sand and coarse aggregates. Large weigh batching plants have automatic weighing equipments. To produce uniform and good concrete, it is necessary to mix cement, sand and coarse aggregate, first in dry condition and then in wet condition after adding water. and mixing is continued. Full amount of water is added and mixing is completed when uniform colour and consistancy is observed. The process of mixing is completed in 6–8 minutes of adding water. This method of mixing is not very good but for small works it is commonly adopted. In large and important works machine mixing is preferred. 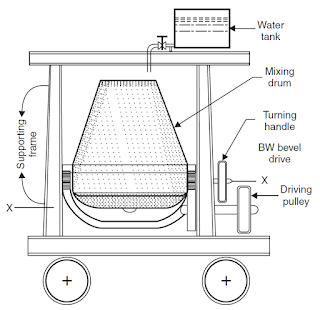 Below figure shows a typical concrete mixer. Required quantities if sand and coarse aggregates are placed in the drum of the mixer. 4 to 5 rotations are made for dry mixing and then required quantity of cement is added and dry mixing is made with another 4 to 5 rotations. Water is gradually added and drum is rotated for 2 to 3 minutes during which period it makes about 50 rotations. At this stage uniform and homogeneous mix is obtained. 3)Transporting and Placing of Concrete. After mixing concrete should be transported to the final position. In small works it is transported in iron pans from hand to hand of a set of workers. Wheel barrow and hand carts also may be employed. In large scale concreting chutes and belt conveyors or pipes with pumps are employed. In transporting care should be taken to see that seggregation of aggregate from matrix of cement do not take place. Concrete is placed on form works. The form works should be cleaned and properly oiled. If concrete is to be placed for foundation, the soil bed should be compacted well and is made free from loose soil. Concrete should be dropped on its final position as closely as possible. If it is dropped from a height, the coarse aggregates fall early and then mortar matrix. This segregation results into weaker concrete. In the process of placing concrete, air is entrapped. The entrapped air reduces the strength of concrete up to 30%. Hence it is necessary to remove this entrapped air. This is achieved by compacting the concrete after placing it in its final position. Compaction can be carried out either by hand or with the help of vibrators. In this method concrete is compacted by ramming, tamping, spading or by slicing with tools. In intricate portions a pointed steel rod of 16 mm diameter and about a metre long is used for poking the concrete. Concrete can be compacted by using high frequency vibrators. Vibration reduces the friction between the particles and set the motion of particles. As a result entrapped air is removed and the concrete is compacted. The use of vibrators reduces the compaction time. When vibrators are used for compaction, water cement ratio can be less, which also help in improving the strength of concrete. Vibration should be stopped as soon as cement paste is seen on the surface of concrete. Over vibration is not good for the concrete. are useful in concreting slabs. Vibrating tables are useful in preparing precast concrete elements. Curing may be defined as the process of maintaining satisfactory moisture and temperature conditions for freshly placed concrete for some specified time for proper hardening of concrete. Curing in the early ages of concrete is more important. Curing for 14 days is very important. Better to continue it for 7 to 14 days more. If curing is not done properly, the strength of concrete reduces. Cracks develop due shrinkage. The durability of concrete structure reduces. (b) Covering the surface with wet gunny bags, straw etc. (e) Application of curing compounds. Walls, columns, plastered surfaces are cured by sprinkling water. Columns and other vertical surfaces may be cured by covering the surfaces with wet gunny bags or straw. The horizontal surfaces like slab and floors are cured by stagnating the water to a height of 25 to 50 mm by providing temporary small hunds with mortar. In the manufacture of pre-fabricated concrete units steam is passed over the units kept in closed chambers. It accelerates curing process, resulting into the reduction of curing period. Compounds like calcium chloride may be applied on the curing surface. The compound shows affinity to the moisture and retains it on the surface. It keeps the concrete surface wet for a long time. This is defined as the ease with which concrete can be compacted fully without seggregating and bleeding. It can also be defined as the amount of internal work required to fully compact the concrete to optimum density. The workability depends upon the quantity of water, grading, shape and the percentage of the aggregates present in the concrete. Separation of coarse particles from the green concrete is called segregation. This may happen due to lack of sufficient quantity of finer particles in concrete or due to throwing of the concrete from greater heights at the time of placing the concrete. Because of the segregation, the cohesiveness of the concrete is lost and honey combing results. Ultimately it results in the loss of strength of hardened concrete. Hence utmost care is to be taken to avoid segregation. This refers to the appearance of the water along with cement particles on the surface of the freshly laid concrete. This happens when there is excessive quantity of water in the mix or due to excessive compaction. Bleeding causes the formation of pores and renders the concrete weak. Bleeding can be avoided by suitably controlling the quantity of water in the concrete and by using finer grading of aggregates. Harshness is the resistance offered by concrete to its surface finish. Harshness is due to presence of lesser quantity of fine aggregates, lesser cement mortar and due to use of poorely graded aggregates. It may result due to insufficient quantity of water also. With harsh concrete it is difficult to get a smooth surface finish and concrete becomes porous. The characteristic strength of concrete is defined as the compressive strength of 150 mm size cubes after 28 days of curing below which not more than 5 per cent of the test results are expected to fail. The unit of stress used is N/mm2. IS 456 grades the concrete based on its characteristics Strength. expansion depends upon the nature of cement, the type of aggregates, cement content, relative humidity and the size of the sections of the structural elements.Below Table shows the coefficient of thermal expansion of concrete with different types of aggregates. Environmental forces such as weathering, chemical attack, heat, freezing and thawing try to destroy concrete. The period of existance of concrete without getting adversely affected by these forces is known as durability. Generally dense and strong concretes have better durability. The cube crushing strength alone is not a reliable guide to the durability. Concrete should have an adequate cement content and should have low water cement ratio. This is the resistance of concrete to the flow of water through its pores. Excess water during concreting leaves a large number of continuous pores leading to the permeability. Since the permeability reduces the durability of concrete, it should be kept very low by using low water cement ratio, dense and well graded aggregates, good compaction and continuous curing at low temperature conditions. The cement content used should be sufficient to provide adequate workability with low water cement ratio and the available compaction method. This test is conducted to determine the workability of concrete. It needs a slump cone for test Slump cone is a vessel in the shape of a frustum of a cone with diameter at bottom 200 mm and 50 mm at top and 300 mm high. This cone is kept over a impervious platform and is filled with concrete in four layers. Each layer is tamped with a 16 mm pointed rod for 25 times. After filling completely the cone is gently pulled up. The decrease in the height of the concrete is called slump. Higher the slump, more workable is the concrete. This is another test to identify the workability of concrete. This test is conducted in the laboratory. The test equipment consists of two hoppers and a cylinder fixed to a stand, the dimensions and the distances between the three vessels being standardized. Vessel A and B are having hinged bottoms whereas cylinder C is having fixed bottom. Top vessel A is filled with the concrete to be tested. As soon as it is filled, the hinged door is opened. Concrete is collected in vessel B. Then the hinged door of B is opened to collect concrete in cylinder C. The concrete in cylinder C is weighted. Let it be W1. Now cylinder is again filled with the sample of concrete in 50 mm layers, which is compacted by ramming and vibrating. Then the weight of compacted concrete is determined. Let this weight be W2. The ratio W1/W2 is termed as compaction factor. Metallic moulds of size 150 mm × 150 mm × 150 mm are used for casting concrete cubes. Before filling mould, it is properly oiled on its inner surfaces, so that cubes can be easily separated. Fresh cube is filled with concrete to be tested in 3 layers and kept in the room. After 24 hours, cube is removed from the mould and kept under water for curing. After 28 days of curing cubes are tested in the compression testing machine. In this test cubes are placed over the smooth surface which is in contact with side plates of mould. The crushing load is noted and crushing strength is found as load divided by surface area (150 × 150 mm2). Code specify the desirable strength of concrete for 3 days and 7 days for quick assessment of strength of concrete. (e) good resistance to wear and tear. 6. For making building blocks. However major use of concrete is as a major ingradient of reinforced and prestressed concrete. Many structural elements like footings, columns, beams, chejjas, lintels, roofs are made with R.C.C. Cement concrete is used for making storage structures like water tanks, bins, silos, bunkers etc. Bridges, dams, retaining walls are R.C.C. structures in which concrete is the major ingradient. Concrete is good in resisting compression but is very weak in resisting tension. Hence reinforcement is provided in the concrete wherever tensile stress is expected. The best reinforcement is steel, since tensile strength of steel is quite high and the bond between steel and concrete is good. As the elastic modulus of steel is high, for the same extension the force resisted by steel is high compared to concrete. However in tensile zone, hair cracks in concrete are unavoidable. Reinforcements are usually in the form of mild steel or ribbed steel bars of 6 mm to 32 mm diameter. A cage of reinforcements is prepared as per the design requirements, kept in a form work and then green concrete is poured. After the concrete hardens, the form work is removed. The composite material of steel and concrete now called R.C.C. acts as a structural member and can resist tensile as well as compressive stresses very well. 1. It should be capable of resisting expected tensile, compressive, bending and shear forces. 2. It should not show excessive deflection and spoil serviceability requirement. 3. There should be proper cover to the reinforcement, so that the corrossion is prevented. 4. The hair cracks developed should be within the permissible limit. 5. It is a good fire resistant material. 6. When it is fresh, it can be moulded to any desired shape and size. 7. Durability is very good. 8. R.C.C. structure can be designed to take any load. (d) Chejjas, roofs and slabs. R.C.C. walls built are 1.5 m to 2.0 m thick. It is the combination of reinforcement, brick and concrete. It is well known fact that concrete is very weak in tension. Hence in the slabs, lintels and beams the concrete in the portion below the neutral axis do not participate in resisting the load. It acts as a filler material only. Hence to achieve economy the concrete in tensile zone may be replaced by bricks or tiles. Dense cement mortar is used to embed the reinforcement. The reinforcement may be steel bars, expanded mesh etc. Strength of concrete in tension is very low and hence it is ignored in R.C.C. design. Concrete in tension is acting as a cover to steel and helping to keep steel at desired distance. Thus in R.C.C. lot of concreteis not properly utilized. Prestressing the concrete is one of the method of utilizing entire concrete. The principle of prestressed concrete is to introduce calculated compressive stresses in the zones wherever tensile stresses are expected in the concrete structural elements. When such structural element is used stresses developed due to loading has to first nullify these compressive stresses before introducing tensile stress in concrete. Thus in prestressed concrete entire concrete is utilized to resist the load. Another important advantage of PSC is hair cracks are avoided in the concrete and hence durability is high. The fatigue strength of PSC is also more. The deflections of PSC beam is much less and hence can be used for longer spans also. PSC is commonly used in the construction of bridges, large column free slabs and roofs. PSC sleepers and electric piles are commonly used. elements. After concrete of hardens, prestressing wires are passed through ducts. After stretching wires, they are anchored to concrete elements by special anchors. Plain concrete possesses deficiencies like low tensile strength, limited ductility and low resistance to cracking. The cracks develop even before loading. After loading micro cracks widen and propagate, exposing concrete to atmospheric actions. If closely spaced and uniformly dispered fibres are provided while mixing concrete, cracks are arrested and static and dynamic properties are improved. Fibre reinforced concrete can be defined as a composite material of concrete or mortar with discontinuous and uniformly distributed fibres. Commonly used fibres are of steel, nylon, asbestos, coir, glass, carbon and polypropylene. The length to lateral dimension of fibres range from 30 to 150. The diameter of fibres vary from 0.25 to 0.75 mm. Fibre reinforced concrete is having better tensile strength, ductility and resistance to cracking. 1. For wearing coat of air fields, roads and refractory linings. 2. For manufacturing precast products like pipes, stairs, wall panels, manhole covers and boats. 4. Carbon FRC is suitable for structures like cladding and shells. 5. Asbestos FRC sheets are commonly used as roofing materials. varies from 3 kN/m3 to 8 kN/m3 whereas plain concrete density is 24 kN/m3. It is also known as aerated, foamed or gas concrete. 1. It has low weight. 2. It has good fire resistance. 3. It has good thermal insulation property. 4. Thermal expansion is negligible. 5. Freezing and thawing problems are absent. 6. Sound absorption is good. 7. It has less tendency to spall. 1. It is used for the construction of partition walls. 2. It is used for partitions for heat insulation purposes. 3. It is used for the construction of hollow filled floors. Luigi Nervi carried out scientific tests on ferro-cement and used it to replace wood wherever possible. He built small tonnage vessels, the largest being 165 tons motor sailor. Nervi also pioneered the architectural use of ferro-cement in buildings. Ferro-cement can be given the finish of teak wood, rose wood etc. and even for making tables, chairs and benches it can be used. 1. Its strength per unit mass is high. 2. It has the capacity to resist shock laod. 3. It can be given attractive finish like that of teak and rose wood. 4. Ferro cement elements can be constructed without using form work. 7. Reapers and raffers required for supporting roof tiles. Excellent blog shared. If anyone looking for steel fiber then you can contact Precision Drawell. Thanks for sharing. An amazing article. It’s nice to read a quality blog post about concert. I think you made some good points in this post that how can we use concrete and how can we mix it. Thanks for sharing such a nice blog post with us.